Maxed Out takes us on a road trip that is sometimes hysterical and often horrifying: from Las Vegas to the Bible Belt, from the backwoods to inner cities where the world's largest financial giants troll for their next victims. Welcome to a country populated by debt pirates, corporate predators, human credit card billboards, debt evangelists, mega-million dollar spec homes, and, of course, trillions of dollars of easy credit. Combining startling facts with even more startling examinations of individuals, institutions, the government, and modern religion, James Scurlock exposes very real, potentially disastrous systems and policies that are drowning millions of Americans in a flood of easy credit. 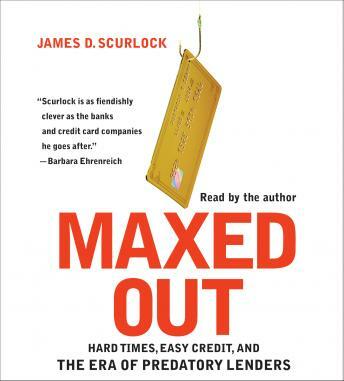 Expanding on his award-winning documentary of the same name, hailed as 'scathing' and 'unusually entertaining' by Newsweek and Variety, Maxed Out confirms that Scurlock is an author 'as fiendishly clever as the banks and credit card companies he goes after' (Barbara Ehrenreich, bestselling author of Nickel and Dimed).